What is said to be the largest concentration of celebrity artwork ever exhibited will debut to the public at Artexpo Las Vegas, from September 28 to 30, 2007 at Mandalay Bay Resort & Casino. 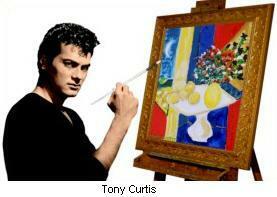 Tony Curtis will be honored at noon on Saturday, September 29 with Artexpo's first Lifetime Achievement Award for his outstanding contribution to the arts. Grace Slick will be in attendance for special appearances on Saturday, September 29 from 2 – 4 pm and on Sunday, September 30 from 1 – 3 pm, where she will sign special dedications and take photos with clients that are purchasing her art. Tickets for Artexpo Las Vegas are available the day of the show at the Mandalay Bay Resort & Casino, or at the Artexpo website. The show is open to the public on Friday, September 28, 2007 from 12-6pm, Saturday, September 29, 2007 from 11am to 6pm, and Sunday, September 30, 2007 from 11am to 5pm. Adult tickets are $10 a day; $5 for seniors and students. Children under 12 are free.